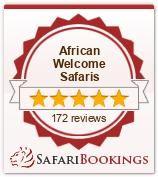 It is situated on the Sand River at the very heart of the Sabi Sands Game Reserve. This reserve in turn forms part of the Greater Limpopo Transfrontier Park, a vast and growing area, currently covering 6 million acres and incorporating the famous Kruger National Park. This rich wild wonderland assures exceptional game drives and a true wilderness experience. Founders Camp honours past guests and staff who have contributed to building Londolozi and assisting in distilling all the ecotourism learning of the past 30 years into a singular state. Enchanting and intimate, Founder’s Camp is ideally situated to provide an insider’s view on the secrets of river life. Five idyllic sanctuaries repose in the shade of ancient Ebony and Matumi trees along the banks of the Sand River. This is safari in the classic style, replete with classic black and cream ticking fabric and original mahogany beds. Deep leather couches, military chests, compass safari lamps and a riverside lounge sala, create a mood of easy luxury and laid back welcome for discerning families and travellers. The historical safari of old dates back to the age when reserves were hunting concessions and value was placed on an animal according to its potential danger when hunted on foot. In today’s safari practice, rifles have been replaced with cameras, and the only shooting done is the photographing of majestic animals, birds and trees. Londolozi’s rangers specialise in photographic safaris and, where possible, will position the vehicle for the guest to get the best angle for photographic purposes. They will also part with advice and knowledge where they can so that the guest is able to get the best photograph possible.Many of the rangers and trackers at Londolozi grew up living off the land in these parts and therefore have an unmatched knowledge of both the area and the elements of nature within this wilderness wonderland. Londolozi boasts two of South Africa’s only 17 master trackers, which only adds to the excellence of the team and the experience they are able to deliver. At Londolozi the Varty family has refined the menu of activities to include a unique blend of senses and soul, creating an offering of sophisticated style and adventure that has recaptured the subtle essence of the Swahili word for journey – ‘Safari’. At Londolozi we offer spectacular Big 5 game drives in our extensive wildlife area with unsurpassed leopard viewing but this is just the beginning of what really constitutes “the Londolozi experience”. Londolozi is the ideal space to escape from the rigours of everyday existence, to shift into a full appreciation of the moment and awaken the senses. With this in mind we have created tailor-made activities to help recuperate mind, body and spirit.Take your pick, the list is virtually endless; silent wilderness immersions, interpretation and learning, spiritual journeying, adventure & adrenalin, massage, yoga, clay pigeon shooting, all day wilderness trekking, poetry, theatre, friendship and wide open spaces.